These cupcake recipes are amazing and I want to eat every single one of them! These are not the average boring cupcake. Here you will find 9 Awesome Cupcake Recipes. Click the title below the image to get to the recipe tutorial. 9 awesome cupcake recipes. Delicious and Beautiful Gourmet Cupcakes that you can make! Easy DIY recipe tutorial ideas. 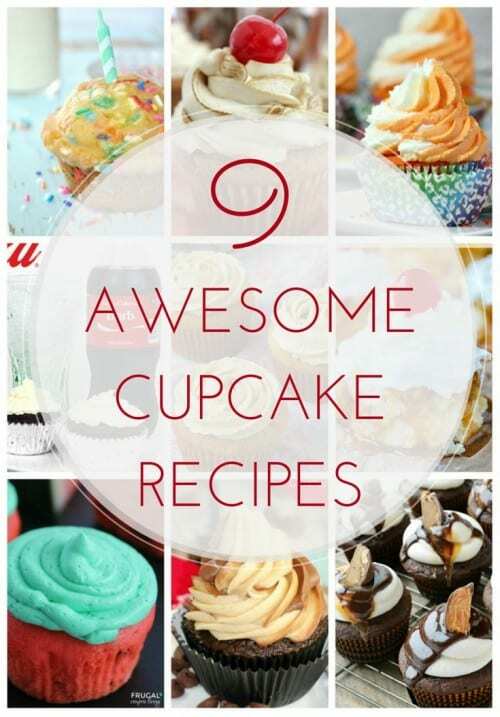 SAVE 9 AWESOME CUPCAKE RECIPES TO YOUR FAVORITE RECIPES PINTEREST BOARD! Those all look so yummy, especially the Birthday Cake and the Creamsicle!!! Umm Those Watermelon Cupcakes look AMAZING! I’m definite;y going to take a peak at some of these! I love to read your posts and recipes. The photos you post make me really hungry. Thanks for sharing this recipe. I want every single one of these! I think I should just make one a week for the next 9 weeks, minus maybe the banana one, because bananas aren’t really my thing…although my kids love them…off to pin this! Thanks! Stopping by from Let’s be friends blog hop! Thanks for stopping by Sarah! I love cupcakes too so I totally get it. Katie…shut the front door! Those all look insanely delicious! Thanks so much for sharing at Dishing It & Digging It! ha ha ha! your welcome Lori and thanks for stopping by.